The President announces the 200 lottery finalists; Vanessa makes a discovery about the kidnapping. Based on Shirley Jackson's short story "The Lottery." 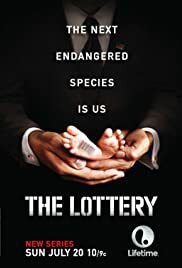 An adaptation of Shirley Jackson's short story of the same name, "The Lottery" tells the story of a shocking annual tradition in a small village. A small New England town's local lottery has an unexpected twist. Very different book, this series begins with a scientist trying to find a solution that seems to be the world's population, or American, the global problem of infertility already scared, but the the scientist is not even there, she tries to look for a cure unhappiness of not having a family and not good memories of the past, she want to fertilize eggs so she can build her family based on science and knowledge. it can fertilize, but the other influential people who also want this treasure, and nothing happens as she imagine.No the background to a parent looking to get your child and have a normal life, however the government appears to have plans for the population that was born in the epoch of infertility mundial.O fate of father and scientist will cross, to discover what is behind this great mystery.